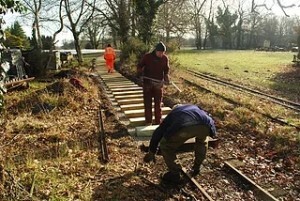 The 2 foot gauge railway at Bressingham Steam Museum has this winter had a short section re-laid. A 100 – 200 yard long curve sits on boggy ground and the sleepers had become badly rotted. These were replaced along with a renewal of the rail, substituting a lightweight rail for one considerably heavier. It is expected this will provide longer life to the track and be less prone to deformation. The rail replacement is part of an ongoing programme to upgrade the track quality on the whole of the Nursery railway. This project has now covered almost the whole circuit and has improved the track significantly. 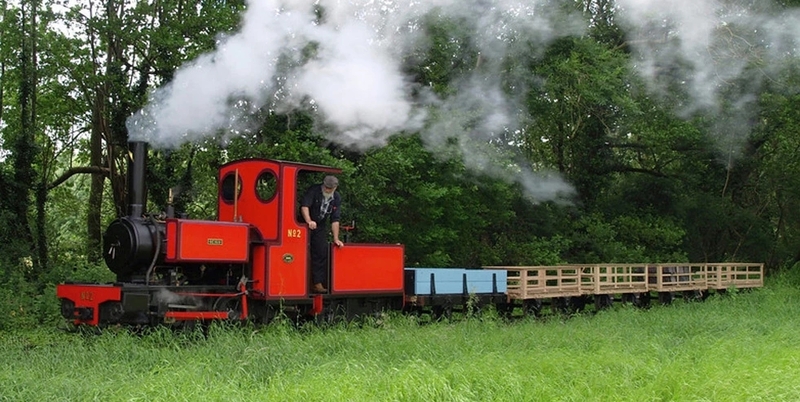 The Nursery railway was first laid out by Alan Bloom as a short 1/2 mile loop in the mid 1960’s. Over the following years it was extended four times to circumference the main growing areas of the former Blooms Nursery. The present circuit runs for about 1 1/2 miles. It is the most intensively used railway at Bressingham and is operated by a 1909 quarry Hunslet 0-4-0 ‘George Sholto’. Occasionally a new build side tank 0-4-0 ‘Bevan’ hauls a demonstration slate train. This entry was posted in News on 16th February 2015 by Tim Bridge.